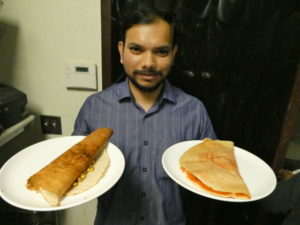 Sam Siri shows off an onion-chili-paneer dosa (left) and a mysore masala dosa (right). You know the Taco Tuesday promotions at Mexican restaurants? Well, get ready for Dosa Night — all-you-can-eat evenings at Indian eateries. At least half a dozen Charlotte area restaurants now feature Dosa Nights on Tuesdays or Wednesdays. We dropped in on one at Sithara on Highway 29 near UNC Charlotte. 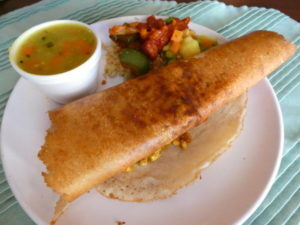 What are dosas? Paper-thin crepes, griddled to a crispy golden-brown, then rolled around all manner of fillings. You won’t find them at all Indian restaurants, only those specializing in the cuisines of south India. Sam Siri at Sithara hails from Hyderabad, a regional capital in southern India that sends lots of technology professionals to the U.S. When Siri’s wife got a computer engineering job in Charlotte, he teamed up with a cousin to open Sithara. Dosa nights are Tuesdays at Sithara. Plunk down $9.99 (children $5.99) and choose from a special menu of more that a dozen “veg” and “non-veg” selections — each made the moment you order. Making a mysore masala dosa (top) and an onion-chili-paneer dosa. The list changes from week to week, but I keep returning to the mysore masala dosa. Its filling combines chunky mashed potato with a hint of curry and a tomato-red chutney, mildly spicy. Other possibilities range from chicken tikka, to ground lamb, to Bombay noodles. There are even dessert dosas filled with a splash of chocolate or strawberry syrup. The dosas are only half of the deal. There’s also a buffet with curries, rice dishes, chili chicken and vegetable stews. Siri says that customers especially like moong dal halwa, an Indian take on the Middle East’s popular halva dessert. On Tuesdays the restaurant hums with a mix of Indian families, tables of young professionals, and non-Indians from UNC Charlotte. Bollywood films run on one video screen, cricket games on another. 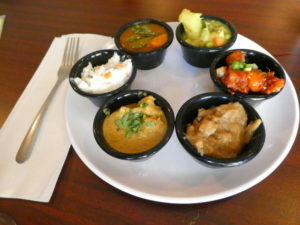 Build your own sampler plate at Sithara’s all-you-can-eat buffet. 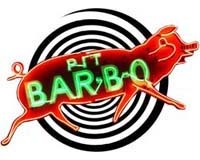 Tuesday – Thursday 5:30 p.m. – 10 p.m.
Friday 5:30 p.m. – 10:30 p.m.
Saturday 11:30 a.m. – 3:30 p.m., 5:30 p.m. – 10:30 p.m.
Sunday 11:30 a.m. – 3:30 p.m., 5:30 p.m. – 10 p.m. 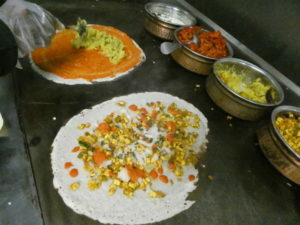 Along with Sithara, half a dozen other Indian restaurants in Charlotte have Dosa Nights. Tuesday – Sunday 11 a.m. – 3 p.m., 6 p.m. – 10:30 p.m.
Tuesday – Thursday 11:30 a.m. – 2:30 p.m., 5:30 p.m. – 10 p.m.
Friday 11:30 a.m. – 2:30 p.m., 5:30 p.m. – 10:30 p.m.
Saturday 12 noon – 3 p.m., 6 p.m. – 10:30 p.m.
Sunday 12 noon – 3 p.m., 6 p.m. – 9:30 p.m.